LANYARD ASSORTMENT by Hy-Ko Products Co. at Delta Everett. MPN: KB356-BKT. Hurry! Limited time offer. Offer valid only while supplies last. Sold as one unit. (1 unit = 32 each.) 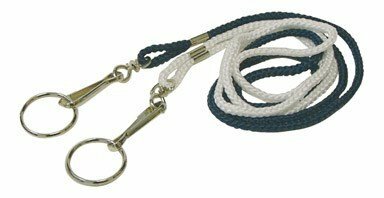 36'' lanyard with clip on 1'' split ring. Color assortment - black, blue, white and red. 32 pieces per bucket. Sold as one unit. (1 unit = 32 each.) 36" lanyard with clip on 1" split ring. Color assortment - black, blue, white and red. 32 pieces per bucket. Manufacturer number: KB356-BKT. SKU #: 9106618. Country of origin: Taiwan. Distributed by Hy-Ko Products Co. If you have any questions about this product by Hy-Ko Products Co., contact us by completing and submitting the form below. If you are looking for a specif part number, please include it with your message.